It’s said that tragedy shapes people—overwhelming them with pain or, at the other extreme, inspiring them to overcome the odds to serve as an inspiration for others. When Erika Cooper’s brother—her “best friend”—was murdered in a senseless gun fight when she was just 15, it looked at first like she would be among the defeated. By that time Cooper was living in Waterbury, had gotten married and had her own children. And when her own kids started hanging out on the street corners, she went into action. “I hadn’t seen gun violence yet in Waterbury, and I didn’t want that again,” says Cooper, who is one of the 2016 winners of the Dorothy Richardson Resident Leadership Award. So, in 2010, she founded Uplifting a Life, essentially an “active parents committee.” Its mission is simple: stop talking about problems and start fixing them. It started simply, with movie nights and apple picking. Then it expanded to school volunteering. When violence finally did break out, Uplifting a Life held its first march. 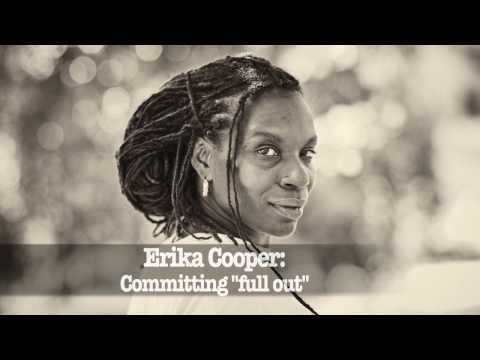 In 2010, Erika Cooper founded Uplifting a Life, essentially an “active parents committee.” Its mission is simple: Stop talking about problems and start fixing them. It started with movie nights and apple picking. That persistence has been critical throughout her life. In April 2007, she suffered a stroke, leaving her legally blind in one eye. She had to re-learn how to walk and talk, taking her out of commission for a year and a half. Later, she found out she has multiple sclerosis (now in remission) and then breast cancer. Did that stop her? In 2015, a year after her first march against violence, Cooper completed Neighborhood Housing Services’ Resident Leadership Training Program and identified another community need: the deficient academic progress of the city’s youth. The public schools in Waterbury are crowded, teachers are overwhelmed and the students are sometimes unruly due to issues at home. Erika responded by establishing the free Almost Home summer camp, with the support of 13 organizations. The more than 70 students are exposed to structured educational activities and receive a nutritious breakfast and lunch. This year, the camp expanded to include an after-school program, and Cooper has joined the Neighborhood Housing Services community-building staff. “The kids keep me young. MS hasn’t gotten to me because of the kids. They’re what keeps me going,” insists Cooper.